LIEUTENANT GENERAL JOHN MACNAIR WRIGHT, JR. was a member of the ORDER OF THE FOUNDERS AND PATRIOTS OF AMERICA, with Order #4504, and was an Associate of the Texas Society, with Society #22. His Founding Ancestor was Edward Wright of Sudbury, Massachusetts, and his Patriot Ancestor was William Wright of Rutland, Massachusetts. He served as SECRETARY GENERAL from 1986 to 1988 and as GOVERNOR GENERAL from 1988 to 1990. John "Jack" MacNair Wright, Jr. was born 14 Apr 1916, at Los Angeles, CA. He died 27 Jan 2014 at Riverside, CA. On 28 Jun 1940, he married Helene Tribit at Beverly Hills, CA. Jack grew up in Hollywood and was active with the Boy Scouts of America, reaching the rank of Eagle Scout. He obtained an appointment to the U.S. Military Academy at West Point, NY, with the Class of 1940. While at West Point, he starred in varsity soccer, becoming an All-American. Upon graduation, 2nd Lieutenant Wright was commissioned in the Coast Artillery Corps and sent for duty in the Philippines, assigned to the 91st Coast Artillery, Philippine Scouts. After the bombing of Pearl Harbor on 7 Dec 1941, the Philippines were invaded by the Japanese. American forces withdrew to the Bataan Peninsula and then to the island of Corregidor. With most of the American artillery already destroyed, he was given a roving 155mm gun and given authority to position it anywhere he had effective fire on the Japanese at Bataan. He fired the last artillery salvo at the Japanese before being forced to surrender on May 6, 1942. Jack was taken prisoner and remained a prisoner of war for the duration of World War II, surviving disease and incredible deprivation. He was ultimately liberated at a POW camp in Korea in Sep 1945. For his actions at Corregidor and leadership afterward, Captain Wright was awarded the Silver Star and the Purple Heart. In 1948, Major Wright served as the Military Attach� to the U.S. Embassy in Paraguay. He later attended The Infantry School at Fort Benning, GA. Promoted to Lieutenant Colonel, he commanded the 3rd Battalion, 508th Airborne Regimental Combat Team. 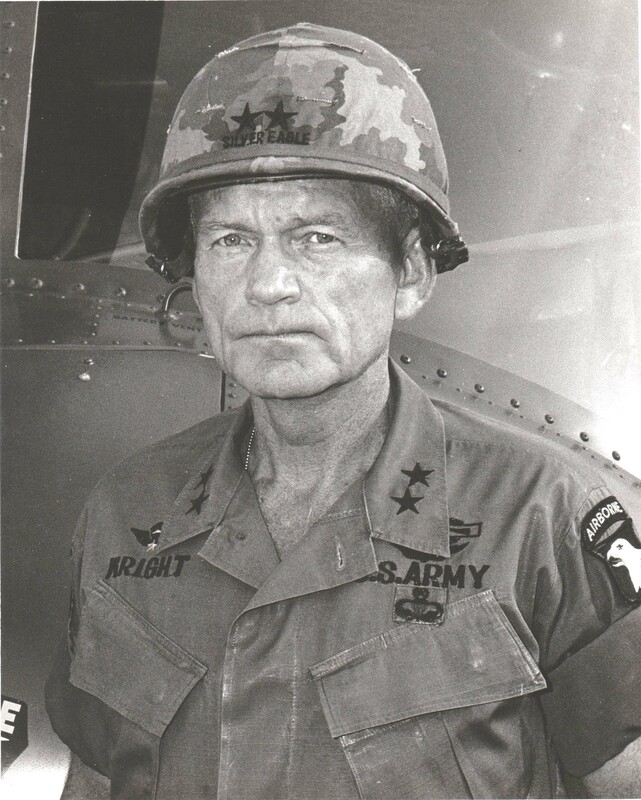 During the Korean War, Lieutenant Colonel Wright served as Executive Officer for the 32nd Infantry Regiment, 7th Infantry Division. In 1961, Colonel Wright attended the National War College, following which he served in Germany as Chief of Staff for the 8th Infantry Division, followed by assignments as G-3 for the VII Corps and then G-3 for the Seventh Army. In 1964, he was promoted to Brigadier General and transferred to Fort Benning as Assistant Division Commander of the 11th Air Assault Division (Test), serving under Major General Harry Kinnard as the Division Commander. It was the purpose of this unit to test, evaluate and develop the airmobile doctrine to be used by the U.S. Army in Vietnam. Brigadier General Wright was determined to become a helicopter pilot himself, and in 1965, he was designated a U.S. Army Aviator. In that year, the division was reformed as the 1st Cavalry Division (Airmobile) and deployed to Vietnam. In 1967, John MacNair Wright, Jr. was promoted to Major General and given command of the Infantry School at Fort Benning, GA. In 1969, he was made Commanding General of the 101st Airborne Division during combat operations in Vietnam. For his leadership, courage and professionalism, he was awarded his second Distinguished Service Medal, the Distinguished Flying Cross and 47 Air Medals. 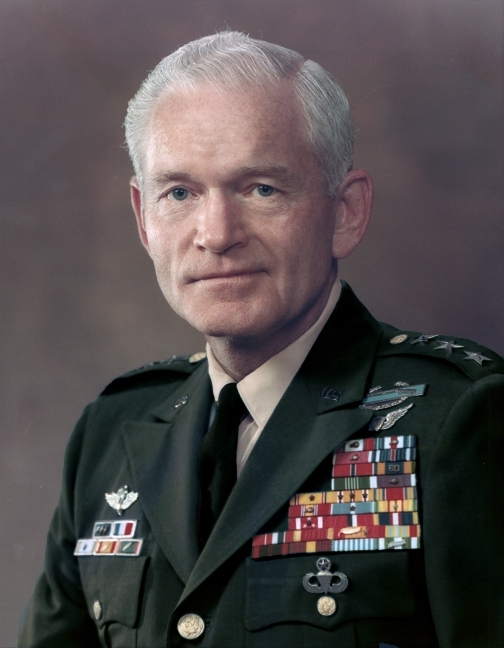 Following his second tour in Vietnam, John MacNair Wright, Jr. was promoted to Lieutenant General and transferred to the Pentagon in Washington, DC, to serve as Comptroller of the Army, a post he held until his retirement from the Army in 1972. Upon his retirement, he was awarded his third Distinguished Service Medal. For his contributions to Army aviation and the development of the airmobile concept of helicopter combat operations, Lieutenant General John MacNair Wright, Jr., USA (Retired) was inducted into the U.S. Army Aviation Hall of Fame in 1986. Upon his retirement from the Army, Lieutenant General Wright served successively as the National Director of Research and Development, National Director of Programs and National Director of Exploring for the Boy Scouts of America. He was awarded the Distinguished Eagle Scout Award in 1971, the George Washington Honor Medal by the Freedom�s Foundation at Valley Forge, and in 2007 was presented the Distinguished Graduate Award by the U.S. Military Academy Association of Graduates.